Astrophotographer Jeff Warner took the image of the supermoon rising over Denver as captured from Green Mountain in Lakewood, CO on Nov. 14, 2016. A beam of light appears to pierce through the sky in this stunning long-exposure of the supermoon full moon of November. Astrophotographer Jeff Warner took the image of the moon rising over Denver as captured from Green Mountain in Lakewood, Colorado on Nov. 14. November's supermoon —a term used to describe a full moon is at its perigee, or closest point to Earth during the lunar orbit — was the biggest and brightest supermoon in almost 69 years. In fact, the full moon won't come this close to Earth again until Nov. 25, 2034. The supermoon was approximately 221,524 miles (356,508 kilometers) from Earth. “Shooting sequences like these is a rigorous, time-consuming process that demands attention to detail on a variety of aspects of the image. I've been confounded in countless ways over the last few years of shooting these sequences, and I still occasionally find a new way to screw it up,” Warner added. Warner created the composite image from 406 individual photos over the course of 33 minutes, 50 seconds. 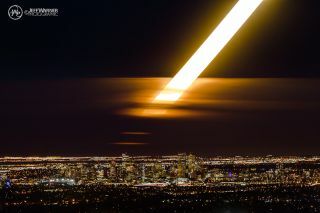 He also had to clone out the air traffic approaching and departing Denver International Airport, which showed as a interrupted 'streaks' of light and general noise throughout the image. He used a Canon 1Dx camera with EF 70-200/2.8L IS II@200mmManual at ISO 200.